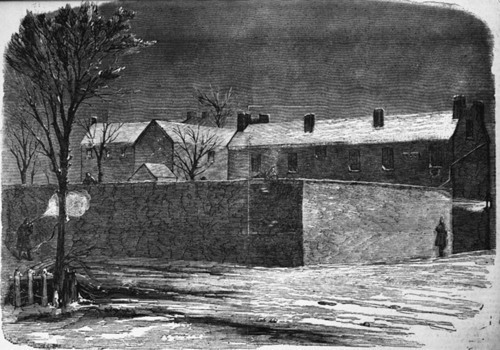 A sketch of the sentinel firing at Cook and Coppic, as they were endeavoring to escape from the jail at Charlestown, on Thursday night, Dec. 15, 1859. Copied from Frank Leslie's Illustrated Newspaper. John Cook and Edwin Coppic were arrested for their involvement in John Brown's raid on Harpers Ferry, Virginia (now West Virginia).